How to Structure a Sabbatical for Your Pastor. A sabbatical is time away from the church to reconnect with God and to rediscover God’s purposes for their life. What should a pastor do on sabbatical? No matter how the church and pastor work out the details, I believe a sabbatical should include four broad movements: rest, renew, recall, and reinvest. The first and perhaps longest phase of the sabbatical should be rest in God. This sabbath rest is important because it sets the stage for all the other movements of a sabbatical. Sufficient rest is necessary to have the clarity of mind and spirit needed to really connect with God on a deep level. During this phase of rest the mind, body, and soul are healing from the stress (and even trauma) of ministry. Rest is not easy – especially for Americans. When we spend time in quiet before God, the inner turmoil in our souls comes to the forefront. This turns a time of rest into a spiritual battle. Deep rest is very hard to attain and many never get there. It requires working through all of our inner darkness, our helplessness, and becoming “naked” before God. Only when we have given up all our own striving can we truly rest in God and his love for us. We learn that our humanity is not defined by what we do but by who we are in Christ – becoming human beings again instead of human doings. The time of rest is coming to a close when we begin to experience ourselves solely as people who are deeply loved by God in Christ. As we begin to rest deeply in the love of God it can be tempting to get back to work. This would be a mistake. Like the athlete who is recovering from an injury, we need to take it slow and rebuild our strength before re-entering the game or we risk further injury. The renew phase is all about living in the love of God until it becomes our foundational reality. During this phase we begin to live in such a way that every day is shaped by our identity as a child of God who is deeply loved. We learn how to live as Father and child again. Renewal is all about building a relationship with God that will reframe and sustain our lives. We begin to learn to live from our rest in God instead of resting from our work for God. We experience the fullness of God’s life in us – to be filled with all the fullness of God (Ephesians 4:14-19). This presence of God within us will transform how we approach life and ministry. Here we learn how to minister from a place of power through dependence on God (Ephesians 4:20-21). Only then are we ready to recall God’s purposes for our lives. Having surrendered to the will of God, it’s time to step back and look at the big picture of our lives. What has God been up to? How has he prepared me for this moment in time? What direction is he leading? Working to get clarity on our calling will take time but it will give us confidence when we re-enter ministry. This clarity of call will help us push through the obstacles, conflicts, and sabotage that accompanies leading change. Once we have clarity, we are ready to being planning how to return to ministry in a healthy way. The reinvest stage of the sabbatical is all about planning and practicing a new way of living. Many find it helpful to establish a rule of life during this phase. A rule of life is a plan of daily living that emphasizes relationship with God at various points of the day. It also includes plans for self-care, which can be so easy to neglect. Caring for the body, mind, emotions, soul, and family must come before ministry or ministry will become self-destructive. During this phase we ask, “How can I maintain my new life in God while fulfilling God’s clear call on my life?” Remember, if these two things are in conflict you’re doing something wrong. Give yourself some time to practice this new way of living before returning to ministry. Is the Church Responsible for Pastor Burnout? How long should a sabbatical be? Sabbaticals are typically between 40 days and one year. From a practical standpoint, 40 days doesn’t seem long enough to move through the four phases described above. A year-long sabbatical might create too much distance between pastor and church, thus making it difficult to reconnect. I believe 90 days is the sweet spot – long enough to work through everything at a deep level but not so long that separation begins to occur. However, the short answer to this question is a sabbatical should be as long as the pastor and church think is necessary to deeply reconnect with God. Where should a sabbatical take place? 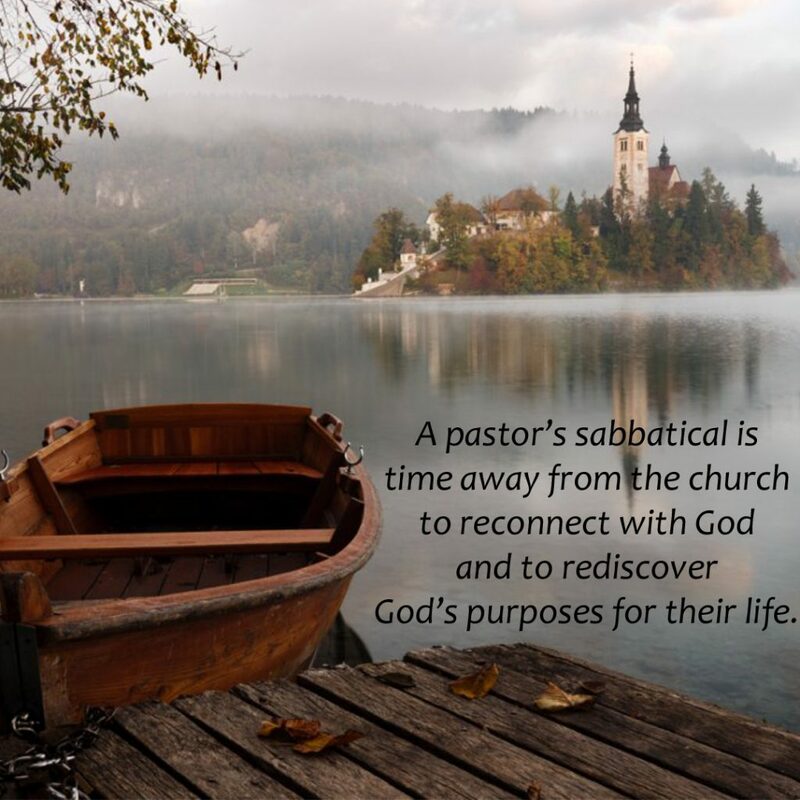 The location of a sabbatical is not as important as the fact that the pastor should not return to his church at any time during the sabbatical. Some can take their sabbatical at home; for others this would be a disaster. Travel can help provide clarity as long as it isn’t a time of busy sightseeing. Monasteries can be a great place to develop a rule of life and learn to practice a daily office of regular prayer times. Each pastor is going to be different in what ministers to them. I knew one pastor who spent 40 days traveling the country on his motorcycle and living in a tent. Others have gone away to a friend cabin for a month or more. Some will travel to Europe or the Holy Land. Again, the key is to ask, “What does the pastor need to deeply reconnect with God?” The answer to that question will give you guidance on where to go. When is the right time to take a sabbatical? The right time to take a sabbatical is before it is needed. When a sabbatical is taken too late, it can be hard for the pastor to return to the church – too much damage has been done. Most denominations recommend a pastor take a sabbatical every five to seven years. This is a good guideline but it may be necessary to take one earlier. If the pastor has had three years filled with conflict, trauma, or emotional hardship, the church would be wise to send their pastor on sabbatical early. What does the pastor need to deeply connect with God? If healing is necessary now or soon, it’s time to go on sabbatical. What should the church do while the pastor is on sabbatical? Depending on the length of the sabbatical, it may be necessary for the church to hire an interim pastor. It may be helpful to bring in an expert who can train the church on how to care for their pastor. In some cases, this is a good opportunity for the other elders in the church to experience preaching for several weeks in a row. This will help them understand how to minister to the pastor better. Whatever the church decides, it will probably require some advance planning. Does your church have a plan for pastor sabbaticals? If not, how could you begin this process? What does your pastor need to deeply connect with God?